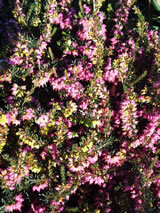 Shrub with a dense wide spreading habit. Emerging leaves are bronze turning dark green with age. A mass of rosy red bell-like flowers cover the bush in winter and spring. Best planted in a sunny position, in well drained soil. Frost hardy. Grows in sun or semi-shade / Will tolerate very hard frosts. Dwarf, height 0.3 and 1 metre. We have this currently available in a POT 2.5 container. Ask for it at your retailer.